Looking for ideas on how to build a movable switch target in N-Scale, i.e. one that rotates with the movement of the points. I've been playing with this idea for years and have tried various methods, none of which have worked. Love to hear your suggestions/ideas. I'm not certain, but I believe the Briggs Models switch stands were designed to have rotating targets although you would have to make up a linkage that connects them to the points. I recall few ideas for such a switch stand tossed around here. Some etched, others 3D-printed. You shoudl be find those threads with some simple forum search. 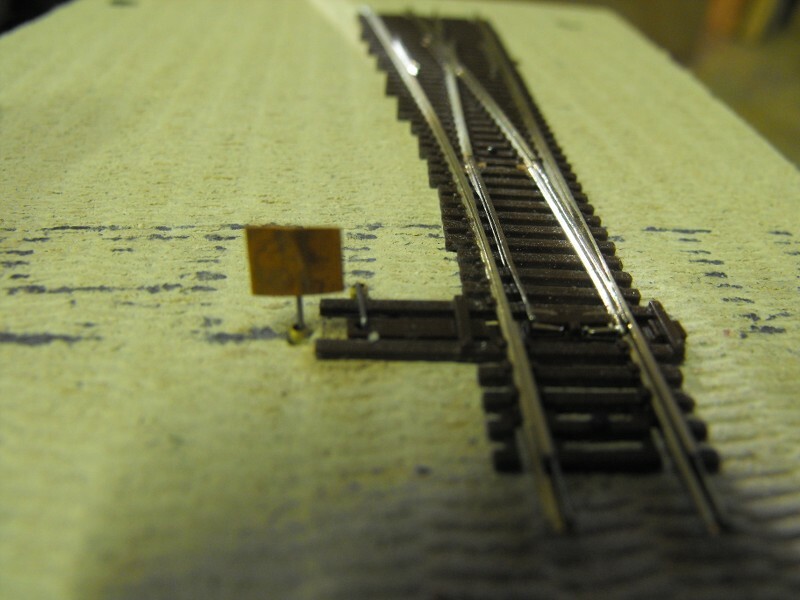 Yes the Briggs Models switch stands were designed to be operational, and i spent quite a bit of time figuring out how to do it using an article by Gordon Odegard in an old Kalmbach book. The challenge is that the length of the crank is extremely short and very difficult to spend accurately for a precise 90 degree rotation. I put the project on the backburner to focus on completion of tracklaying, but it is something I hope to get back to at some point in the future. That was the problem I had with my proof-of-concept. I believe the key is "don't bend", it has to be a machined, precision offset, probably something 3D printing could handle. When I get back around to this project I'll have to draw something up and see if it works. As usual, I obviously wasn't clear in my original post. I do have the Briggs switch stands. They are BC Rail prototypical so they're exactly what I need. What I'm looking for is a way to rotate the target as the points are thrown. I'll have a look at the thread link posted by C855B. Any other ideas are most welcome. I have made one that's a manual switch operator with the target moving an exact 90 degrees and also one for an Atlas dual coil switch machine mounted directly to the bottom of the ties, also accurate 90 degree rotation, affording the above table operating switch stand and target but also serving as the manual operator as you no longer have access to that when it's buried below. I saw them as producible in the few hundred quantities at a time but at a budget that would probably not fly ($20-$30 each?). With the new printer at least the stand part might be able to be printed at a cost less than the machined part but the key operating guts would still need to be accurately machined. It is in my plans to revisit this even if only for my own use. To produce one that operates on a simple lever getting its motion from the very short switch throw and the fact that the throw varies one to another is all part of the problem as already identified and I'm sure proven in many failed attempts over the years. And here's why. The calculated lever arm to turn a target 90 degrees based on .035" switch throw is a few tenths shy of .025". So a change in any and all of those joints or action at the throw, any play at the pivots, linkage, bearing, etc all add up to pretty extreme target travel error for a very small change or play in any of those components. A stack up of all motion errors of only .005", that's for the switch throw, the linkage, any alignment errors, results in a 20% target motion error, and the likelihood of seeing a few thousandths in each of the pivots, a little more at in the flopping guide bar, a few more at the bearing, and then .010" variation +/- in the throw bar travel and you can see that a functioning linkage for even a sloppy turning target constructed of simple levers becomes near impossible even with pretty accurately produced parts. None of the parts cooperate. Is this really of interest to folks, especially as described? Of interest, yes. A showstopper, no. I just thought of it again the other day and figured I'd re-visit it. Sounds like things haven't progressed any further than they were when this first came up years ago. I think it would be ultra-cool to have movable switch targets but the effort required may not be worth it. I'm going to keep looking at it anyway. Here's a video from several years ago with the first prototype I made to see if it would even work. This is done to an Atlas code 80 switch and utilizes their standard dual coil machine but could be adapted to pretty much anything. What prompted this was making a very small module with only 1" base so no way to put anything under the table. This was attached to the bottom of the switch, right up the middle, and sat in a pocket cut into the foam. The latest one I did was attached topside and served as a manual operator as well as the position indicator. It was also at a very good scale height. I wonder if there is a simple way to control switch stands via a servo? You could run a shaft straight up through the benchwork to the switch stand, and the servos are very cheap @ USD5.00 or less. We just need some bright spark on The Railwire to come up with a way to cheaply control a servo through 90˚ triggered via the auxiliary contacts on a Tortoise or Blue point, or a simple polarity change. (Obviously those using Tam Valley or Arduino servo controllers for their turnouts would already have a solution). 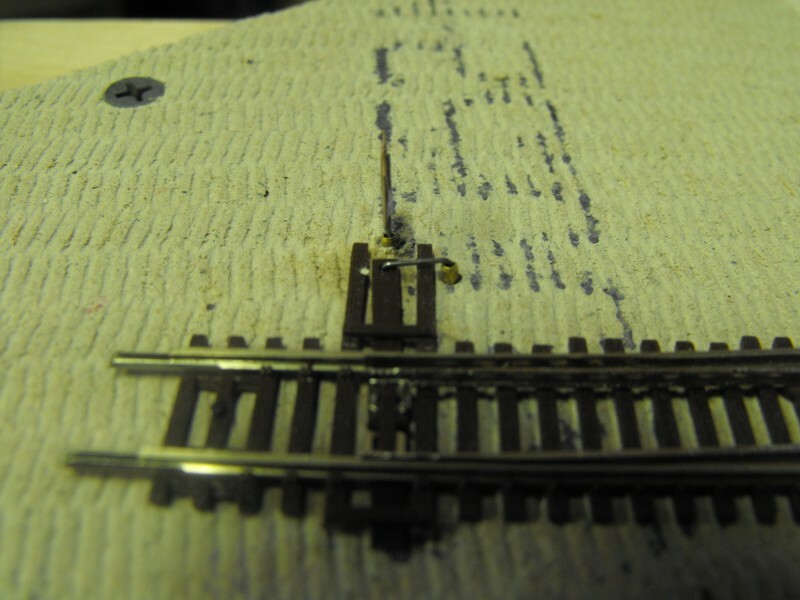 At the risk of thread drift, is there anyone else besides Briggs doing US prototype fine scale switch stands and derails for N scale? I know of NJ International (which seem quite over-scale). Currently I was looking at modifying the Briggs with different targets — but availability seems limited. Think about it. Whether by gear, belt, lever, or spit, you need to net out at a nominal .025" lever. That's tiny and adding connections adds play which adds error. And worse yet, the switch throw bar travel can vary by a good .010" so it would be nice to be able to tune that lever/ ratio because a .010" change results in a 20%+ change in travel therefore error in rotation. That might not look too good. I think I see a way that this could be done. The basic idea would be a wire, basically "Z" bent at the bottom to make the crank, and then fitted into a properly/ carefully cut slot directly in the throw bar. That could also be made on the bench and glued to the throw bar. If these are Atlas switches the throw bar material is glueable so again, maybe the fitting could be done on the bench. this setup has only one joint for play/error. And the "Z" bend would not be a true Z but, in the lever plane, to make life easy, make it over length and then bend a kink in the middle to bring the two verticals back into the nominal .025" lever length, adjustable by how much you bend the kink. This makes the lever length easily tunable at that point. Good fits are the order of the day. Quick summary: The vertical shaft aligns with the center of the slot with the switch in the center position. The throw is measured outside to outside of the lever wire, subtracting one wire diameter to get the C/L of the crank. And right at the bench with your pocket calculator, that throw measurement is determined by getting an accurate measurement of the actual throw of the actual switch it will be fitted to, divide it by .7071, then divide that answer in half. That's your actual lever arm throw with all of the decimals you can stand. I threw this together in less than 30 minutes to see if it would work. I've been using cheap servos controlled with Arduino's for over 3 years now. Out of about 40 on my layout, I've only had one servo go bad. 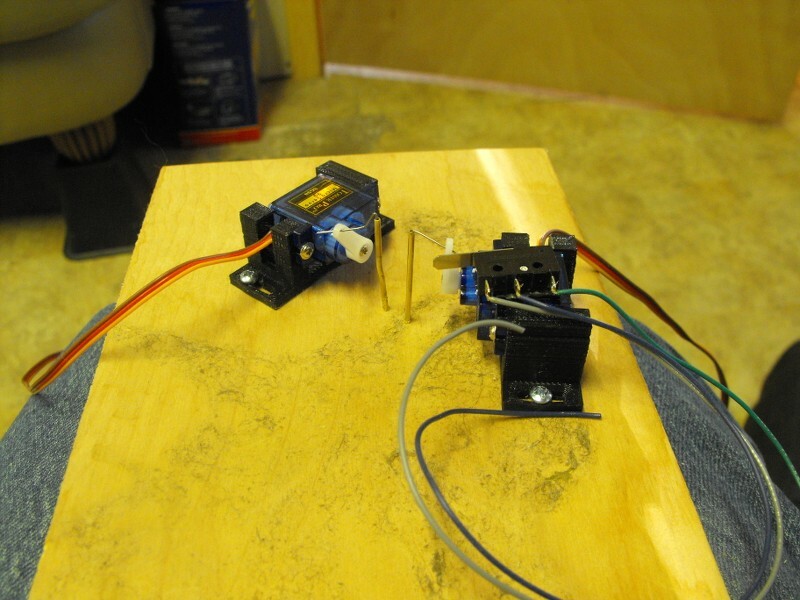 Here is the way I would do it using 2 servos. One would throw the turnout and the other will work the target. My servo mounts are printed, but I've seen them made out of aluminum angle. 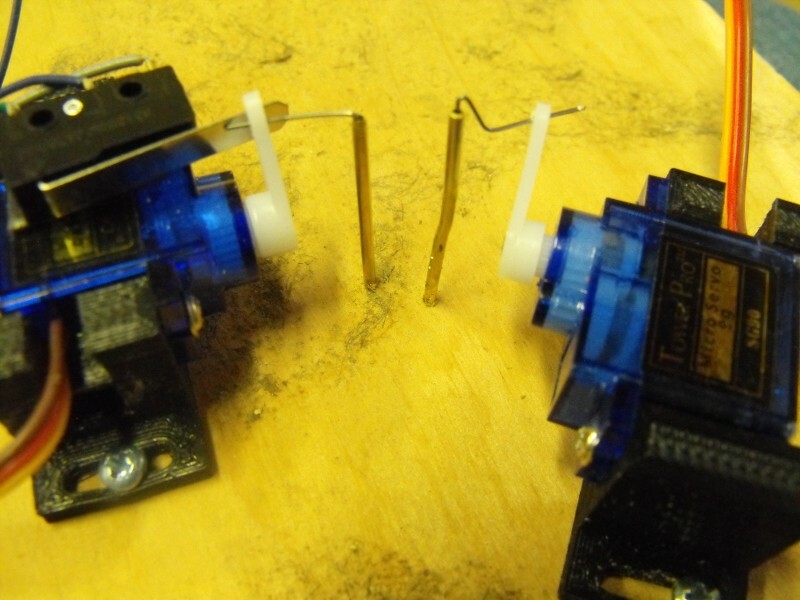 The servo on the left is the one that throws the turnout and you can see that it has a limit switch on it that powers the frog. 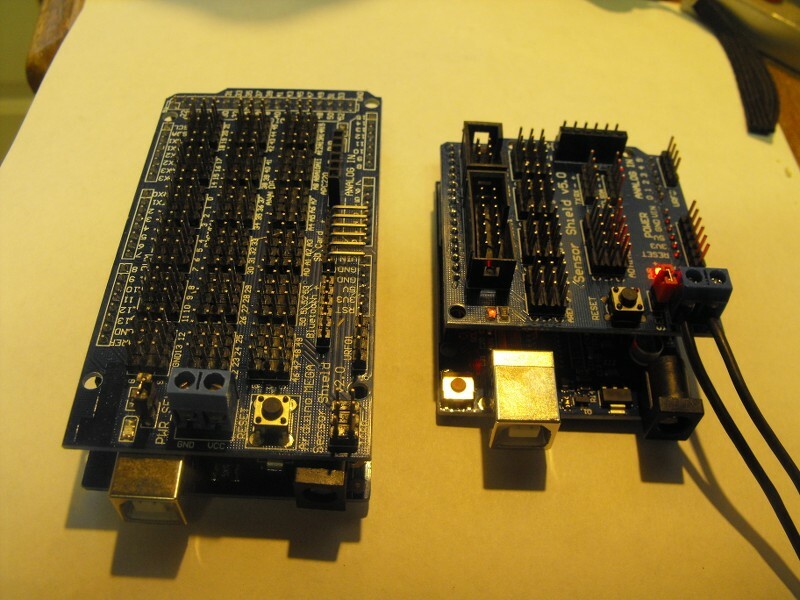 Arduino Uno and Mega with sensor shields. The great thing about doing it this way is that the brass tube can be extended through any thickness of roadbed you have. I have installed some servos that the roadbed was 6" thick foam using the bell crank method. I did have to use a 3" hole saw to cut through the 1/2" plywood base to get the brass tube all the way through and then mounted the servo with heavy duty double sided mounting tape to the foam. Cost wise, the last batch of 100 servos I bought cost $1.40 each shipped. Uno's and Mega's can be had for as little as $4 each and the shields about the same. The sketch I have for the Uno will operate 8 servos and the Mega 22 servos. To throw the servo, the pin on the Arduino is high till you short out the pin and then it goes low and the servo works to the other pos. In the sketch that is downloaded on the Arduino, you can set the degrees you want the servo to operate to and from. I have all mine set at 60 degrees and 120 degrees and that seems to work well. 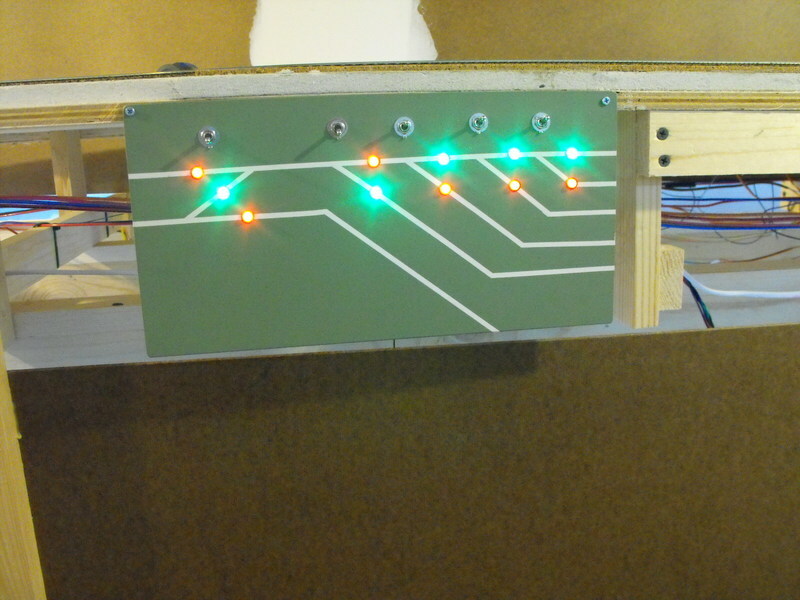 Then I use DPDT switches to control them, one side of the switch powers the LED's and the other to the shield to ground the pin. Here is one of my panels. Rodney shows exactly what I meant earlier when I stated to use longer lever. Heck, if using a servo, one could couple the switch target directly to the servo's output shaft and have it set to rotate 90 degrees.